The Auction for Haiti on my blog,just started, so I will not know how much money has been raised from the effort until next week. But I can say that we are definitely raising awareness. Bloggers typically are considered the stewards of up-to-the minute editorials and blasts of information. However, the recent tragedy in Haiti has prompted a new role for bloggers: changemakers. And it all began with a single action: a tweet by blogger Jeanine Hays. On January 13 at 10:27 a.m., Jeanine wrote, "Are there other design bloggers doing posts about the destruction in Haiti? I'm wondering if together we can coordinate a way to help." This message quickly flourished into a movement: Bloggers Day of Action for Haiti. This movement highlights the power of a single action - as well as potential directions for the blogging community to evolve into leaders of change, echoing the sentiments of anthropologist Margaret Mead, "Never doubt that a small group of thoughtful, committed citizens can change the world. Indeed, it is the only thing that ever has." Let's continue the blog movement for Haiti. For each comment posted through January 22, I will personally donate $1 to the American Red Cross (up to $250). I was honored to interview Jeanine Hays for the Huffington Post community. Jeanine shares more about the movement below. How did the Bloggers Day of Action for Haiti originate? It started with a simple tweet on January 13th at 10:10am: " Are there other design bloggers doing posts about the destruction in Haiti? I'm wondering if together we can coordinate a way to help." A few minutes later I received messages from a few of my blogging friends on twitter who were interested in doing something and who wanted to know if I was putting something together. I replied at 10:27 am: "I'm thinking about a blog day of action. Maybe Thurs or Fri where design bloggers commit to a post." And that's when this small movement began. First, three blog friends wanted to commit to doing a day of action on Thursday. We set a date via twitter, and that was it. Then an artist who is friend on twitter said she would like to donate a piece of art to put up on my blog to auction. So, at 11:00am the idea for an auction was born! An hour after my 10:00am tweet I sent out another at 11:17am and was overwhelmed by the response: "Anyone who is interested in coordinating a Bloggers Day of Action for Haiti please email me directly." Ten bloggers had committed by noon, and suddenly we were looking for artists to donate to the auction. Within a couple of hours seven artists and designers had committed items for the auction. I spent the evening connecting with bloggers and artists via email, and by Thursday morning: almost 20 blogs were a part of the effort. Write one post, that might focus on Haitian art, photography, or design, to help readers learn more about the country. Link readers to a site where they can donate funds to charities that are helping people in the country. You can visit the White House Blog for information on charities, or choose one of your own. Don't forget to let your readers know via Twitter or Facebook. Link to other blogs that are participating in this Day of Action. Is the Day of Action occurring only on Thursday January 14th or do you hope that it extends beyond the single day? The original plan was for the day of action to take place on the 14th. But I have received emails from more blogs that would like to participate, and artists who would like to donate to the auction. We now have 10 items for auction, and so that will go on for at least the next few days. I will ask the bloggers who participated if they would like to continue raising awareness for the effort over the next week or so. How has the blogging community responded to this event? Do you think this response is representative of blogs in general or a specific niche of blogs? I have mainly reached out to design and fashion blogs since I am the Creative Director and Founder of my own home decor shop, AphroChic, and those are the folks that I follow on twitter. And I really love that this community has taken this issue on. The bloggers who are involved are artists, interior designers, stylists, crafters, mommy bloggers, entrepreneurs. The diversity makes this even more powerful, and shows how people from all different paths can come together around one effort. If the effort continues, I hope to get more blogs engaged from a range of blogging communities. From this experience, do you see new potential in the power of bloggers to create change? Do you see this event creating a ripple effect and inspiring the blogging community to come together in a more proactive way on a consistent basis (i.e., not wait for another tragedy to occur)? In this experience I have seen the full power of social networking to create change. A simple tweet led to bloggers around the country joining in this effort. And today they are raising awareness and helping to raise funds through twitter, facebook and their blogs. Bloggers have a unique voice. They are people who write about their passion, and have people join them every day as they discuss what they love. Today, bloggers who participated in the Day of Action used that voice to inform people about a social issue they cared deeply about. It truly is a powerful thing. The bloggers I am working with are excited that this is a unified effort, because strength does come in numbers, and when a number of bloggers are speaking on an issue people do start to listen. I have no idea where the Bloggers Day of Action will go, but I can tell you that I am so excited about the response, and how good this makes me feel inside that I want to find a way to continue this effort and to bring bloggers together around other social issues that they care about. It would be wonderful to have this continue on a consistent basis. How much money has the community raised so far? How much do you hope to raise? How have some bloggers contributed? Right now our focus is on raising awareness and letting our readers know where they can go to donate funds for relief efforts. The Auction for Haiti on my blog, AphroChic just started, so I will not know how much money has been raised from the effort until next week. But I can say that we are definitely raising awareness. People are drawn to what is happening here, and it's so exciting to see. We didn't develop a fundraising goal, and we had no idea how many people we would reach, but we wanted to work collectively to raise awareness and help a country that has been devastated. And I think we have done that, in just 24 hours. I think we have all surprised ourselves in seeing how positive the response has been. 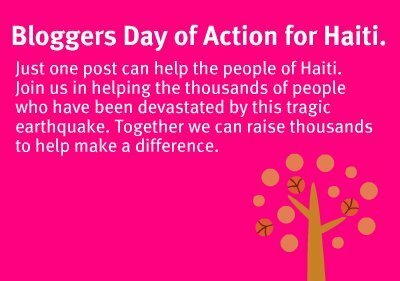 If others are interested in participating in the Blogger's Day of Action for Haiti, they can email jeanine@aphrochicshop.com to get involved. Continue the blog movement for Haiti. For each comment posted through January 22, I will personally donate $1 to the American Red Cross (up to $250). Update: Thank you so much to everyone who commented on this post. 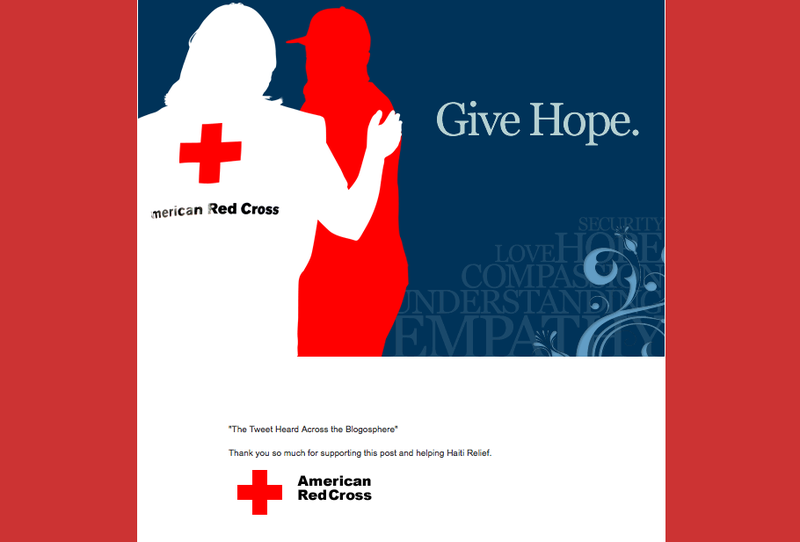 I have donated $36 to the American Red Cross for each of your comments. The e-card below was sent in receipt of the donation for Haiti Relief.